I love snowmen and snow, especially on Christmas cards, which is totally opposite to the weather we have here in Australia at Christmas – it is summer for us! But this does not stop me from making ‘White Christmas’ cards. 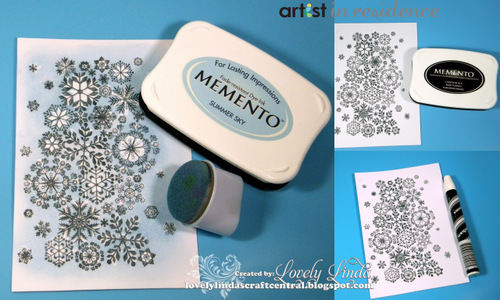 The snowflakes on this card were a lot of fun to colour using the Wax Resist Technique – it is so very easy as you will see. 1. Stamp image using Memento Tuxedo Black. Allow to dry thoroughly. 2. Colour areas using white crayon. 3. Sponge image using Memento Summer Sky, applied with a Sponge Dauber. 4. Highlight areas of the image using Danube Blue with a Sponge Dauber. 5. Wipe excess ink off coloured areas after each color has been applied. 6. Sponge Delicata Golden Glitz randomly to highlight as desired. 7. Touch up white areas using a white pen. 8. 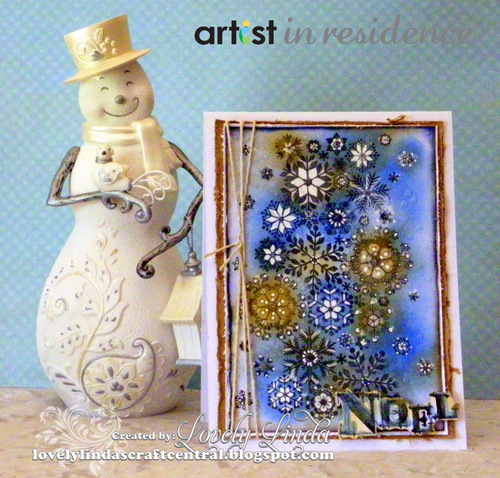 Add random drops of Pico Embellisher in Shimmer to the card front and allow to dry. 9. Cut coloured image to size, approximately 3½˝x 5½˝. 10. Distress the edges using scissors or a distressing tool. 11. Adhere to a slightly larger piece of kraft card stock using E-Z Adhesive. 12. Distress edges of the kraft cardstock piece. 12. Wrap twine around layered card twice and secure with a knot. 13. Adhere layered image to white card base 4 x 5½˝. 14. Stamp sentiment onto white cardstock using Tuxedo Black. 15. Colour using Summer Sky and Danube Blue ink. 16. Pop onto lower right hand corner of the card with 3D Foam Squares. 17. 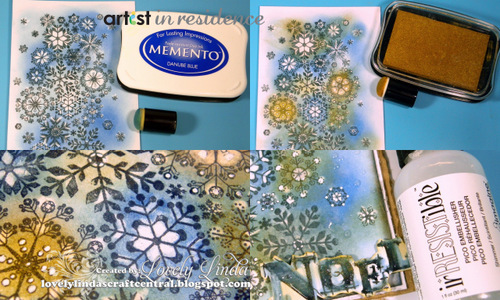 Apply Shimmer Pico Embellisher over the sentiment and allow to dry. This entry was posted in Cards, Linda Lucas. Bookmark the permalink. How fun!! LOVE the colors and sheen~~ TFS!